Roger Avary (Pulp Fiction, Reservoir Dogs) will be delivering a Wolfenstein film in the style of Captain America and Inglorious Basterds. After several years hiatus, the Castle Wolfenstein movie looks like its back on track. Roger Avary, a primary contributor to Quentin Tarentino's Pulp Fiction, is attached to the project alongside Silent Hill producer Samuel Hadida. Castle Wolfenstein is billed as an "action adventure film in the vein of Captain America and Inglorious Basterds". The plot is inspired by key elements of the franchise, telling the story of a US Army captain and a British special agent tasked with shutting down Hitler's secret weapon and confronting members of the SS Paranormal Division along the way. 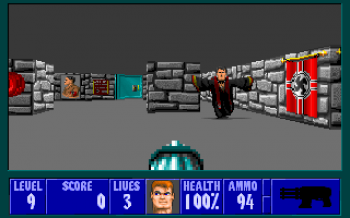 Avary, who will be writing and directing the film, claimed to be a big fan of the Wolfenstein series since he was a child, and attributed the games' "outlandish sensibility" to be a primary influence in his writing and directing career. "I have always thought Wolfenstein, transformed and opened for the screen to wider audiences not familiar with the games, would be a major cinematic experience, which is why I introduced it to Samuel. He bought the rights, and I could not be happier that we are now embarking on this adventure." Hadida expects the final product to be irreverent and over-the-top in a similar style to Pulp Fiction, yet "also strongly character driven and based on a very solid story". In 2007, Avary and Hadida originally planned to create a Return to Castle Wolfenstein movie taking up similar roles, but the project was put on hold after Avary was arrested in 2008 for DUI and manslaughter.